Today is supposed to be 100 degrees. Ok, where you live that might be normal, like in the desert, or death valley, or somethin' like that. But where I live, it's not supposed to be that hot, like ever. Even more so since we've had a lovely and unseasonably cool summer. Now Mother Nature is all like, I'm going to be 100 degrees when you are ready for some cool, crisp Fall weather... in your face! But, I'm still going to drag my pumpkins out of the basement and make it look like Fall up in here this week. The heat is supposed to break and the weekend is going to be beautiful... Yippee! Speaking of yippee I got something in the mail that made me all like "Yippee!" I am not an official Hoosier but Mr. Chic and I lived there for about 5 years right after we got married and my oldest was born there. I have a special place in my heart for the Hoosier state. 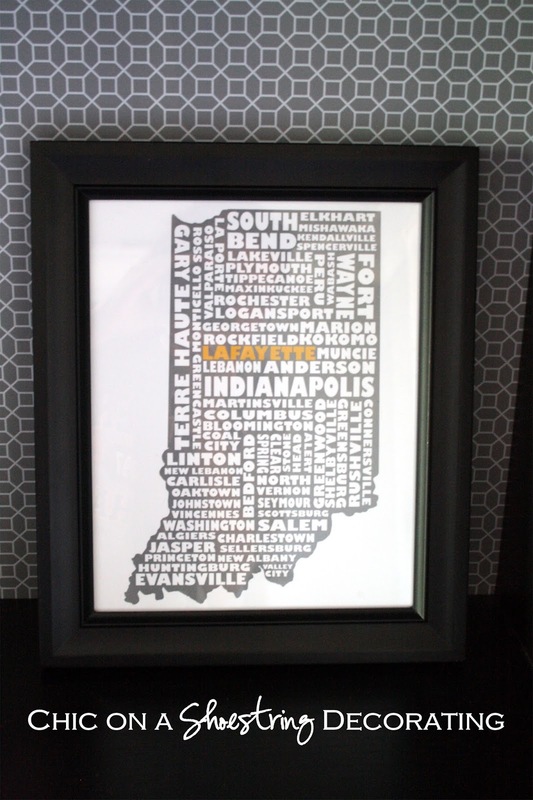 So, Map My State was so kind to send me this lovely personalized Indiana print for my son's room. He is an official Hoosier (although he doesn't remember living there) and this map is a nice little reminder of his special birthplace. I chose the colors to match his room, they are perfect. The city he was born in is colored yellow. How sweet is that?! It goes great on his book case in his "Bigger Boy Room" which you can see the rest here. You can get any state and just about any color combination you'd like with the city you'd like in your color choice. They will also add specific cities to the map if it isn't already on their maps. If you don't see it, just ask them at Map My State. 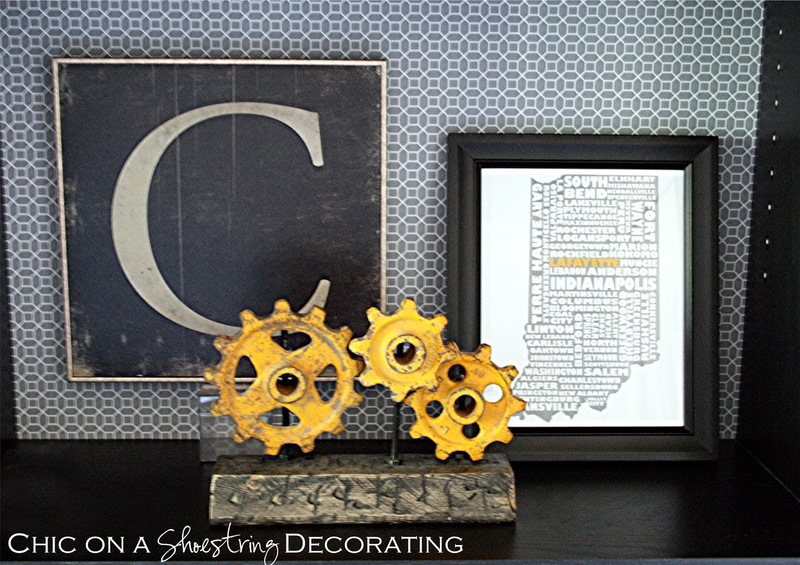 They are so helpful and will gladly customize their art for you. There are so many special reasons that could serve as the inspiration for a map... the city you met your spouse, where you were married or engaged, for each child's birth city, your home town, your college town, places you've lived over the years, your favorite city, just to name a few. Text can be added at the bottom of the state map if you'd like to make it even more personal. Map My State is a husband/wife team small business, I love supporting small business! Please check them out. They have graciously offered my lovely readers a 20% discount for a limited time. Just type in CHIC at checkout. *Disclosure: I was given 2 free maps by Map My State to review on my blog. All opinions are 100% mine. I do not receive compensation for any purchase you make from Map My State. See my full disclosure policy listed in the Advertise column above. Those are so cute! Love the idea of having all three, although ours would be 3 maps of Indiana (may be overkill) :) I am hearing you on the weather! I made a fall DIY tablescape that I posted today and I painted the pot in like 100% humidity!! Felt a little weird to be arranging pine cones with that! Ohhh! I love the Indiana map. Very cute! 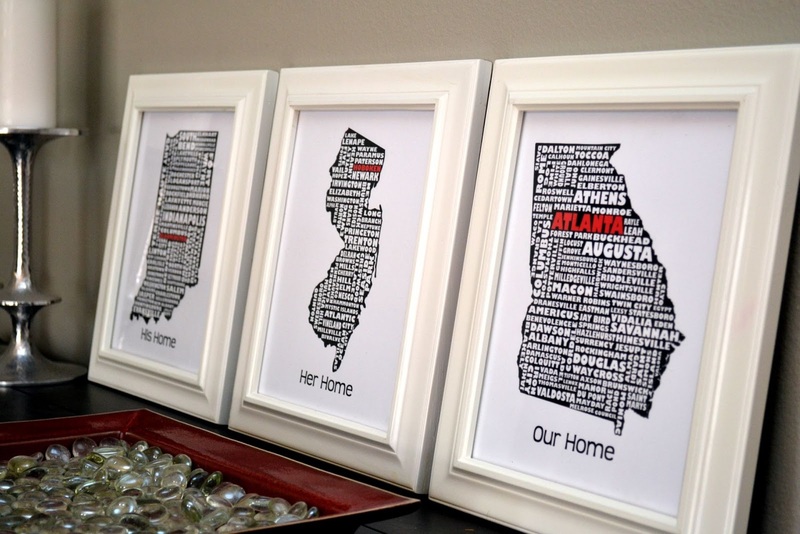 This would be a cute idea for my brother whose 4 children have all been born in different states...Ohio, Illinois, Tennessee, and Indiana. Don't worry...I got the song...you're not nuts but now "Back Home Again" is stuck in my head. Love this idea - so cute! These would make great gifts. What an awesome Personalized Art.Awesome post,the way you explained it is absolutely informative. Again thanks.